Sikkim nestles in the lap of nature and it is the perfect place to visit if you want to savour the joys of studying the flora and fauna of a hill landscape. There are many trekking trails wending their way through a magnificent landscape of forests, flower filled valleys, rivers, waterfalls and lakes. 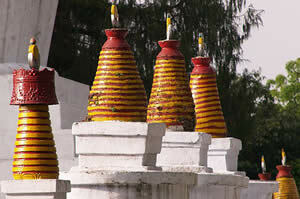 For people who enjoy the spirit of adventure and discovery Sikkim offers many pleasures. This ecologically untouched park is located in a remote area covering 1784 square kilometres. It stands at the edge of the giant Zemu glacier in the shadow of the row of peaks around Kanchenjunga like Lamaongden, Narsing and Pandim. Visitors need to be experienced in trekking at heights to go there. Many mountaineering expeditions are organised on the rows of snow covered peaks that encircle the park. The fauna here includes the snow leopard, Himalayan black bear, red panda and barking deer. 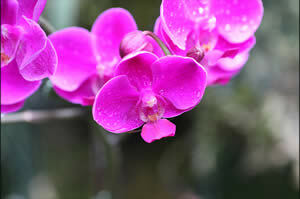 There is a month long orchid festival in Gangtok in summer. The orchid sanctuary is in a secluded forest attached to the Namgyal Institute of Tibetology at Gangtok. Here you can see over four hundred varieties of orchids that grow in Sikkim. The flowers bloom between May/June and September/October. Another Orchid sanctuary is at the Orchidarium near Rani Khola by a tributary of the Teesta River. 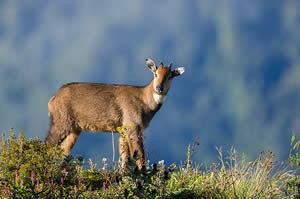 Sikkim has a number of wildlife sanctuaries like the Kanchenjunga National Park, Fambong Lho Wildlife Sanctuary, Meenam Wildlife Sanctuary, Singba Rhodendron Sanctuary, Kyongnsla Alpine Sanctuary and the Varsey Rohododendron Sanctuary. 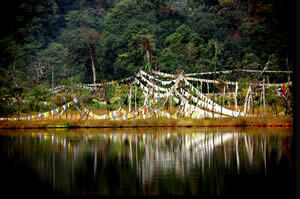 This sacred lake is a site of pilgrimage for the people of Sikkim. The magnificent stretch of water is surrounded by peaks, there are fluttering prayer flags everywhere and the crystal clear water reflects the colours of the sky. Sikkim has many other lakes that are worth a visit and sitting beside their calm waters can be a very peaceful and reviving experience. Among the other lakes, many of them located at remote locations and offering an ambience of serenity and peace are Tsomgo, Menmecho, Lampokari and the Gurudongmar that is named after Guru Rimpoche and is sacred to the Sikkimese people. 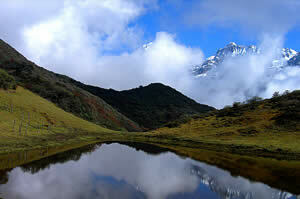 Sikkim is a trekkers’ paradise and offers some of the best trekking routes in the Himalayan region. For instance a trek through the Barsey Rhododendron Sanctuary passes through verdant forests of not just rhododendron but also silver fir, hemlock and magnolia as the skyline is framed by the peaks around the Kanchenjunga. In spring and summer the valleys are covered in flowers with hovering birds and butterflies and the waterfalls touch the mountains with flashing silver.